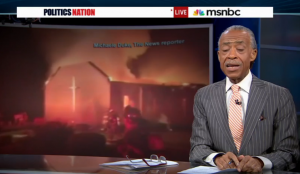 Why are black churches burning? The churches are of different denominations, separated by state and county lines, and by their unique settings and surrounding communities; yet the number and potential pattern have raised alarms. Since June 17, when nine black parishioners were gunned down by a white supremacist inside a South Carolina church as they held a Bible study, more than a half dozen black churches, most of them in the South, have burned. Some have been scarred, others leveled to the ground. And now, congregations are rethinking security measures heading into the holiday weekend, and people nationwide are asking, including on social media, Who is burning black churches? The latest incident, here in Greeleyville, where Mt. Zion AME Church was engulfed in flames Tuesday night, collapsing the roof of the red brick structure in the small, rural town about 50 miles from Charleston, attracted a now familiar phalanx of media Wednesday. It was the seventh southern church fire to be reported nationwide, plus another in Ohio. And while South Carolina Gov. Nikki Haley told MSNBC’s Craig Melvin that Tuesday night’s fire was was the result of at least four lightning strikes – not arson or anything sinister – investigators on the ground say no determination has been made.